Professors from the world’s top business schools will analyse case studies relevant to the Russian market and guest experts in business, politics and culture will speak about how to apply international practices in the Russian business reality. The participants of the programme will be provided with an official state-recognised document — a diploma or a skills development certificate. Duke CE, INSEAD, IMD, Wharton Business School, IESE Business School, NYU Stern School of Business, ESMT, Yale SOM, Harvard Business School and others. The programme line is changed and updated every year, depending on the profile of the audience and market trends. The programmes are accompanied by simultaneous interpretation into Russian, which allows participants to get the best international education without any effort. Professor of Digital Technologies, Digital Business, and IT Strategies, IESE Business School (Spain). Open Enrollment Programmes of Moscow School of Management SKOLKOVO: Business Digitalisation. Professor of Practice in Negotiation Dynamics, Moscow School of Management SKOLKOVO. Founder and President of NEST Consulting. One of the leading Israeli experts in negotiations. Consultant, executive coach, and practicing trainer for leadership team development. For over 10 years, he has worked with the largest corporations and state companies in Russia, Western Europe, Singapore, and the Asia Pacific region. Professor of Project Management, Moscow School of Management SKOLKOVO, D.B.A., PMP, CCP, CISA, CCE, CM, PSP, EVP, PMI-RM, PMI-SP. Open Enrollment Programmes of Moscow School of Management SKOLKOVO: Project Management, Complex Projects: From Concept to Delivery. Professor in Leadership, Moscow School of Management SKOLKOVO. Honours Dean of Berlin School of Creative Leadership, published more than 10 books on management, leadership, cross-cultural negotiations, philosophy and business. Academic Advisor to the Dean of Moscow School of Management SKOLKOVO. Open Enrollment Programmes of Moscow School of Management SKOLKOVO: Business Transformation and Growth in the Era of New Technologies. Professor of the NYU Stern School of Business (USA). Author of a number of books on business evaluation, risk and corporate finances management, and numerous articles in the world's leading finance publications; maintains a blog called Musings on Markets. Professor in the Production, Technology, and Operations Management Department, IESE Business School (Spain). Open Enrollment Programmes of Moscow School of Management SKOLKOVO: Operational Effectiveness in Manufacturing. Specializes in researching and teaching leadership, cross-cultural communication, and corporate strategy. Frequent instructor of SKOLKOVO programmes, strategic sessions for the school's clients, and business and management courses at other higher educational institutions. Professor, Wharton Business School. Open Enrollment Programmes of Moscow School of Management SKOLKOVO: the Strategic Leadership module as part of the Development of Leadership Potential programme, Strategic Leadership: The Art of Decision-Making. Under his leadership, a number of effective transformations were carried out in the field of metallurgy, mechanical engineering, and production of consumer goods. He has collaborated on many unique innovative projects for various Russian and foreign companies and has been at the forefront of the development of many new products. 2003–2014: General Director, RIA Novosti media holding. 2016–2017: Senior Vice-President, Sberbank of Russia. Professor at Duke University’s Fuqua School of Business, USA. "Dorie Clark is an expert at self-reinvention and helping others make changes in their lives," The New York Times. Open Enrollment Programmes of Moscow School of Management SKOLKOVO: A Brand You Can Trust: Self-Promotion Strategy. Professor of Business Practice, Moscow School of Management SKOLKOVO. Open Enrollment Programmes of Moscow School of Management SKOLKOVO: Academic Director of the HR as a Business Partner Programme. 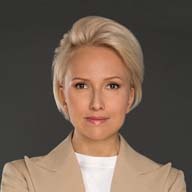 Elena has many years of practical experience in the fields of management and human capital management, including on the boards of directors of Russian holdings. Career consultant. Mentor. From 2012-2017, Elena held the position of Senior VP of Human Resources and member of the board at Sistema JSFC (more than 18 assets in all leading sectors of the economy). Over 9 years of experience in the structures of Sistema JSFC (shareholding company of leading Russian companies MTS, Children's World, MTS Bank, Segezha Group, Kornstadt, RTI, Medsi, Intourist, Step Agroholding, etc.). In 2017-2018, Elena implemented successful projects for small and medium-sized businesses in cooperation with the SKOLKOVO Business School. The projects were aimed at assisting owners in building their people management function, as well as organising HR processes in a competitive environment for professional staff. In 2018, Elena was appointed Associate Professor of Business Practice (Director of Academic Programmes) of the SKOLKOVO Business School. Management experience – more than 15 years, teaching experience – more than 7 years. Elena has implemented a number of unique HR projects. A former presidential campaign spokeswoman, she is a frequent contributor to the Harvard Business Review, and is a consultant and speaker for clients such as Google, Yale University, and the World Bank. She is also a producer of a multiple Grammy-winning jazz album. You can download her free Entrepreneurial You self-assessment workbook and learn more at dorieclark.com/entrepreneur. Andrey’s research is focused on leadership development in a context of Russian management culture. He teaches at and develops new SKOLKOVO executive education programmes and works as an executive coach at leadership development programmes. Andrey’s articles have been published by leading Russian business media (Harvard Business Review, Forbes, RBC, Republic, Inc. and other); he has been a keynote speaker at multiple conferences in Russia and abroad, including TEDx. Andrey is the winner of prestigious EFMD Case Writing Competition 2016 and a finalist of CEEMAN Case Writing Competition 2017. Business cases written by Andrey and his team are taught at SKOLKOVO MBA, Executive MBA and Open Enrollment Programmes, as well as at other business schools. Before joining SKOLKOVO Andrey worked for more than 10 years for the largest Russian and international oil and gas and chemical companies in Russia and abroad, managing projects on strategy development, business development, mergers and acquisitions and implementation of change. Andrey holds an MBA from IMD business school (Switzerland) and a Ph.D. in Economics and Masters in Project Management from Gubkin Russian State University of Oil and Gas. He is currently working on his Doctorate thesis at Cranfield University (UK), focusing on development of leadership identity as narrative. Andrey enjoys running marathons and trails, hiking and mountaineering. His passions are archery, exploring history of Russia through offroad expeditions, coaching and upbringing two kids. Moty Cristal is the founder of NEST Consulting group and the CEO of Negotiation Strategies LTD, a global consulting company which provides complex negotiations and crisis management training, consulting and operational support to senior executives in the corporate world and governments. Following an illustrious career as one of Israel's leading negotiation experts, Cristal established NEST Consulting to bring a unique systemic approach to the world of negotiation and the benefit of his experience and success to the private sector. From 1994 to 2001, Mr. Cristal served in various official capacities in Israeli negotiation teams with Jordan and the Palestinians, and experienced years of intense negotiations. Since 2001, Mr. Cristal advises, consults and trains business people, top managers, CEOs and senior government officials in Europe, Russia, US and Asia in analyzing, planning and designing complex negotiation processes. His experience extends to the energy, construction, financial, technological, pharmaceutical, industrial, transportation and aeronautical sectors, and varies from complex deal-making negotiations, business cross-cultural disputes, union-management conflicts, post-merger integration, to business and national crisis management. NEST Consulting provides its services using the Negosystem™ model: a revolutionary form of negotiation system design engineered and administered exclusively at NEST Consulting. The model improves CEOs and top managers' performance in complex negotiations, and enables an efficient process and successful outcome. Mr. Cristal is a Lt. Colonel (R.) in the IDF, with extensive operational experience in crisis negotiation, and lectures worldwide on crisis negotiation and complex crisis management. He is a visiting faculty at Skolkovo, Moscow's leading Business School, as well as a lecturer at Tel Aviv University, and the Lauder School of Government at the Interdisciplinary Center in Herzelia. He is a research fellow at the Institute for Counter-Terrorism in Herzelia and a visiting scholar in leading international negotiation institutions including the Program on International Negotiation (PIN) at IIASA, Austria, (2001-2008), Program On Negotiation at Harvard Law School (2007) and the IDSS in Singapore, (2004). Graduated Bar-Ilan Law School in Israel (1994), and Harvard Kennedy School of Government (1998), Mr. Cristal is also a doctoral researcher at the London School of Economics. У Евгения Каганера несколько ученых степеней - доктор философии Louisiana State University, MBA Syracuse University и магистратура Государственной медицинской Академии. В настоящее время он является доцентом в IESE, где преподает на программе MBA владение digital-инструментами и стратегию IT в динамичной организации, а также занимает пост директора по изучению инноваций. До начала научной карьеры Евгений Каганер работал в крупной финансовой компании в России. Сейчас он больше сосредоточен на преподавательской и исследовательской деятельности и изучает изменения бизнес-моделей организаций в связи с внедрением IT-технологий. Статьи Евгения публикуются в таких бизнес-изданиях, как MIT Sloan Management Review, Communications of the Association for Computing Machinery и Journal of the Association for Information System. Евгений выступает внешним консультантом для множества компаний по всему миру, в том числе для HP, Oracle, Carlsberg и Desigual. Dr. Sifri has been working extensively with BP “Projects & Engineering College” since 2002. He has been the lead designer/developer for their flag ship courses “Project Management Essentials”, “Introduction to Project Management”, and “Project Management in Practice”. He is a subject matter reviewer for several of the other courses offered such as “Managing Risks in Projects”. Dr. Sifri is one of three instructors that delivered “Projects and Engineering the BP way” in Houston four times a year from 2006-2015. Dr. Sifri has designed a fully integrated project management curriculum for Management Training and Development Centre (www.mtdc.pl) in Warsaw, Poland. The curriculum covers all knowledge areas of project management. He has more than 30 years of experience in managing projects. He has given numerous lectures and training courses for such companies as Motorola, HP, Dow Jones, BP, LUKOIL, PKN Orlen, Peoplesoft, ABB, Eurotel, and Novartis. Dr. Sifri is the author of tens of articles and white papers on project management. Pierre Casse is a full-time Professor of Leadership at the Moscow School of Management SKOLKOVO. He is also Professor of Leadership at the Steinbeis University (SMI-Berlin), IEDC-Bled School of Management (Slovenia), the IAE University Aix-en-Provence (France) and Adjunct Professor of Management at the Kellogg School of Management (USA). He held the "Suez Chair of Leadership" at the Solvay Business School (ULB-Brussels) from 2004 to 2006. He was an IMD Professor from 1986 to 1994. He is the "Dean Emeritus" of the Berlin School of Creative Leadership. His areas of expertise include Organizational Behaviour, the Global Market and Cultural Differences, International Negotiations and Strategic Leadership. Pierre Casse has published more than 10 books in the areas of multicultural management, leadership, intercultural negotiations, and philosophy and business (among them "Philosophy for Creative Leadership in 2007). He serves as a consultant to many multinational companies and he is the CEO of "Business Innovation Network" (BIN-Switzerland). Tomas Casas is the director of the SKOLKOVO EMBA International Module in China and the professor of the Macroeconomics course SKOLKOVO degree programmes. He also teaches a variety of courses on team leadership, philosophy of science or doing business in China at institutions across the globe such as the University of St. Gallen (Switzerland), the Rotman School of Business at the University of Toronto (Canada), McDonough School of Business at Georgetown University (US) or Fudan University’s School of Management (China). Research Interests: Entrepreneurship, top performance teams, behavioral economics, venture capital, cross-cultural management, and Asia innovation models. He has developed a variety of high-impact courses whose pedagocial approach revolves around creating value for the participants. He also co-authored the successful book Japan’s Open Future and written many international case studies. Experience: Tomas Casas has been an entrepreneur in China’s trenches for 15 years and is now a business angel invested in over 10 companies based in Shanghai, China. Education: He obtained his Bachelor of Science degree at the Wharton School, University of Pennsylvania (US), and his Master in Science degree at Fudan University (China). He completed his PhD in Economics at the University of St. Gallen (Switzerland). До прихода в Московскую школу управления СКОЛКОВО Максим работал директором по работе с клиентами практики развития лидерства в компании Ward Howell, руководителем бизнес направления компании Human Capital Solutions (эксклюзивный партнер Mercer в России), директором по персоналу в Собинбанке. До этого возглавлял функцию развития персонала в Банке Ренессанс Капитал Потребительское Кредитование и работал заместителем директора корпоративного университета компании Мобильные ТелеСистемы. Максим имеет степень Магистра социологии Московского педагогического государственного университета и является выпускником программы «Executive master in consulting and coaching for change» бизнес-школы INSEAD. Образование: Executive MBA, University of Chicago Booth, School of Business; Economic geography, Eotvos Lorand University; Экономическая география зарубежных стран, МГУ. 1992-2000 – руководила Управлением по информационно-аналитическому обеспечению и связям с общественностью ЗАО «Медиа–Мост». 2001-2003 –первый вице-президент ЗАО «Компания развития общественных связей» (КРОС). 2003-2014 – генеральный директор Медиахолдинга РИА Новости. 2016-2017 – старший вице-президент Сбербанка РФ. Член Попечительского совета Благотворительного фонда помощи детям с тяжелыми заболеваниями «Подари жизнь» (Чулпан Хаматова). Член Правления Благотворительного фонда «Друзья» (Иван Ургант). Член Попечительского совета фонда содействия решению проблем аутизма в России «Выход» (Авдотья Смирнова). Член Правления Фонда развития системы поиска пропавших людей «Метод Центр» (Ирина Воробьева). Профессор Сашо читает курсы лекций по операционному менеджменту, операционной стратегии и аналитическим инструментам операционного менеджмента в рамках программ обучения для руководителей и программ MBA в школе IESE, в Стэнфордском университете, Московской школе управления СКОЛКОВО, Политехническом университете Каталонии в Испании и др. Марк имеет степень доктора наук по организации промышленного производства и управлению технологическими процессами Стэнфордского университета, степень MBA бизнес-школы IESE Университета Наварры, а также степень магистра технических наук по аэрокосмическим технологиям Штутгартского университета, Германия. Vadim Makhov gained extensive practical experience working at Severstal from February 1994 to June 2009, where he began his career as Deputy Head of the Economic Research Laboratory and rose to the position of Chairman of the Strategy Committee of the Board of Directors. Working as Deputy General Director for Strategy and Business Development of Severstal from 2002 to 2008, he was engaged in the development and implementation of the company’s strategy, the development and promotion of its new business lines, and the initiation of many projects, including the creation and development of Severstal Corporate University. In 2004–2007, Makhov was in charge of restructuring the company’s assets in the USA and Western Europe. From 2008 to June 2009, he was Chairman of the Strategy Committee of the Board of Directors at Severstal. In June 2011, Makhov was appointed General Director of United Heavy Machinery Plants (OMZ Group), and he held this position until mid-2016. Under his leadership, a number of effective transformations were completed in metallurgy, machine building, and consumer goods production. He had an active role in many unique, innovative projects implemented by different Russian and foreign companies, and contributed to the development of many new products. Makhov founded and headed Bard Worldwide, a private equity fund that invests in developing cutting-edge technologies. Makhov graduated with honours from the S. Ordzhonikidze State Academy of Management, where he defended his thesis in Economics. In 2000, he received an MBA from Newcastle Business School at Northumbria University (UK). Rob-Jan is a behavioural strategist and world-class expert on visionary leadership. He serves as an expert lecturer at the Wharton School of Business, Thunderbird School of Global Management (USA), and Nyenrode Business University (the Netherlands) and teaches on subjects related to visioning, innovation, and decision making. Rob-Jan is the founder of Vongolo Consulting company. He has worked extensively with engineering companies (Schneider Electric, BP, Total Oil), the financial sector (ING Bank, ABN AMRO Bank), healthcare (Novo Nordisk, Danone Medical), government and non-profit (the Pentagon, Government of Dubai, Red Cross) and a range of other organisations. Aswath Damodaran is the Kerschner Chaired Professor of Finance at the Stern School of Business at New York University, where he teaches corporate finance and valuation to MBAs, executives and practitioners. He has been at NYU since 1986 and was elected as the most popular business school professor in the US by MBA students across the country in a 2011 survey by Business Week. He has written five books on valuation, three on corporate finance and three on portfolio management and his most recent book is Narrative and Numbers, published by Coilumbia University Press. His blog, Musings on Markets, was selected by the Times of London as one of the top ten stock market blogs in the world. He has a semi-active presence online, on Twitter (@AswathDamodaran) and with his website (http://www.damodaran.com). His classes are carried online and on iTunes U and were listed among the top ten MOOCs in the world in 2012. Пожалуйста, оставьте свое имя и контактные данные. Мы направим вам календарь открытых программ на 2019-2020 академический год. When sending the form, you give your consent for personal data processing and storage terms.